If you are in the entertainment business such as modeling or acting which requires you to be photographed often, then consider the effect lighting will have on your smile. Bright lights create more shadows and emphasize discoloration, spaces, crowded teeth, or any other defect or flaws present in the mouth. Remember you are in a business where your smile may make the difference between getting or not getting that dream job, so maximize your ability to have not just a nice smile, but a dynamite smile! But don’t automatically think that “capping” or crowning is your best bet. Now a days you have many different options to correct shape, shade, or size of your teeth without needing a crown. This is where cosmetic dentistry can be a great asset in improving how those bright lights reflect of your teeth. Have one of our cosmetic dentists at Modern Smiles dental office do a smile analysis and cosmetic contouring to make sure the shapes of your teeth are as attractive as possible. Remember that tooth shape and position are more important than color. Don’t go overboard with whitening or pick the whitest color possible in the shade tab for your veneers. Teeth that are too light may look false and unnatural. Don’t go for perfectly straight across upper teeth. They can make you look older and look like you have worn them down over the years. 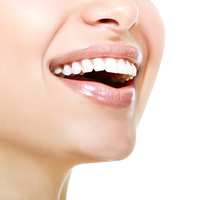 The cutting edge of your upper Teeth should follow the curve of your lower lips when you smile. Porcelain veneers, Invisalign clear aligners, composite fillings, or a combination of them can be used to achieved this look. Widening your arch by doing either a short Invisalign therapy or Veneering your teeth can help get rid of black corridors that appear in the corners of your mouth when you smile. If you’re being closely photographed and will be smiling, be sure not only your teeth look good but also your GUMS! Puffy, red gums can be a sure “turn-off” when your picture is viewed by others. A dental cleaning with one of our hygienist or laser gum recontouring and reshaping may be all that is needed to get your gums ready for the flashing lights. Metal fillings (Amalgam) or crowns can reflect unwanted light into the camera. Alert your photographer in case there a better angle to photograph you or allow one of our cosmetic dentists replace those fillings for you with biomimetic white resin fillings to match your natural tooth’s shape and color. If you are interested in learning more about how cosmetic dentistry can help transform your smile we encourage you to schedule a free consultation either online or calling us at 818.763.9353. During this one-on-one appointment with you can explain your cosmetic concerns, explore your options, and decide which treatment or procedure is best for achieving your goals! Dr Tajik and his entire team are at Modern Smiles are a pleasure to work with. Not only do I wait no more than 3 minutes once I arrive, but they have been able to get me in last minute visits. I recommend them now to all of my friends looking for a dentist neary, and if you’re reading this I recommend them to you too!